In 2006, Mexico intensified its security strategy, forming an inhospitable environment for drug trafficking organizations (also known as DTOs) within the nation. The drug cartels responded by creating new trade routes along the border of Guatemala and Honduras. Soon shipments of cocaine from South America began to flow through the Mesoamerican Biological Corridor (MBC). This multi-national swathe of forest, encompassing several national parks and protected areas, was originally created to protect endangered species, such as Baird's Tapir (Tapirus bairdii) and jaguar (Panthera onca), as well as the world's second largest coral reef. Today, its future hinges on the world's drug producers and consumers. Recently, a report in the journal Science by seven researchers working in Central American forests examined the effects of Mexican drug policies on the MBC, urging policy makers to target ecological devastation as an unintended consequence of a skewed emphasis on supply-side drug reduction policies. They highlight this unfortunate side effect of Mexico's successful law enforcement: the deforestation of pristine areas within smaller countries like Honduras and Guatemala, ill-prepared for an influx of drugs. There is growing evidence for a correlation between drug trafficking and deforestation in Central America today. After 2006, DTOs chose their new trade routes with care. They preyed on the remote forest frontiers of Guatemela's Petén region and eastern Honduras, which were thinly populated with only minimal state presence, where local stakeholders did not have a loud voice. Here, the Science report suggests that drug trafficking has compounded existing problems such as weak governance, conflicting property regimes, high poverty, illegal logging, and agribusiness expansion. 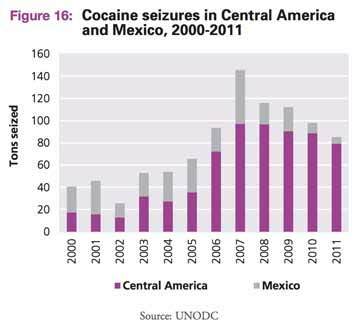 Cocaine seizures in Mexico and Central America over time. Figure from UNODC report on organized crime in Central America. The study used data from the Organization of American States' 2013 report titled Drug Trafficking in the Americas to correlate forest loss with the number of primary cocaine movements in three affected departments in eastern Honduras - Gracias a Díos, Colón, and Olancho. Combined, this area covers almost 50,000 square kilometers or approximately 44 percent of the entire country of Honduras. The United Nations Office on Drugs and Crime (UNODC) reports a total of 52 clandestine airstrips detected by the Honduran Armed Forces in the months of February and March of 2012 in these three departments alone. Exact data, however, are hard to collect when it comes to the drug trade, mediated by the inherent risk to observers in narco-zones, as well as the high levels of illegal activities and violence associated with the narcotics trade. But the UNODC report found that primary movements of cocaine occurred both by air and sea, and included events detected by radar, transfers intercepted by authorities, and reports by reliable intelligence that were unconfirmed by arrests. Forest loss in eastern Honduras was discovered to have increased nearly seven times from 2007 to 2011, with a corresponding five-fold increase in primary cocaine movements. "When drug traffickers moved in," reported Kendra Sweeney, the lead author of the study who has spent over 20 years working in Honduras, "they brought ecological devastation with them." Forest burning on Roatan Island in Honduras. Photo by Rhett A. Butler. Scientists identified three mechanisms by which forest loss occurs soon after the establishment of a drug hub. First, forests are mowed down for clandestine roads and landing strips to receive primary shipments of cocaine. For instance in 2011, UNESCO listed the Honduran Río Plátano Biosphere Reserve as a World Heritage in Danger for its high narco-presence, as evidenced by multiple illegal landing strips scattered across the reserve. The second factor arises when, due to the remoteness of these sites, weak frontiers are suddenly flooded with weapons and cash. "I would get approached by people who wanted to change $20 bills in places where cash is very scarce and dollars are not the normal currency. When that starts happening, you know narcos are there," said McSweeney in a press release. 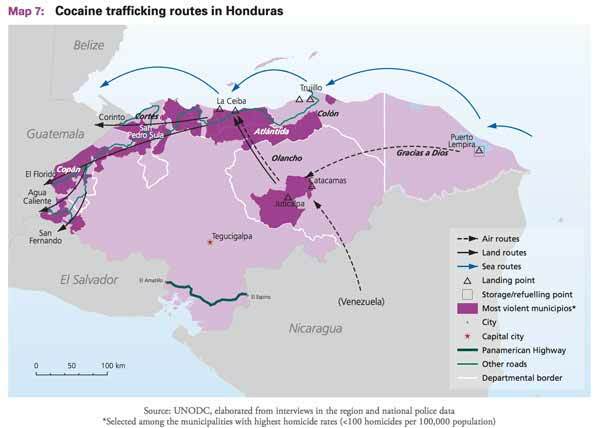 Cocaine trafficking routes in Honduras, with most violent municipalities highlighted in dark pink. Map adapted from UNODC report on organized crime in Central America. Indigenous smallholders, referred to as "key forest defenders" in the study, find themselves dispossessed of their lands and powerless in the face of so much money. Finally, profits from drug trafficking cannot be declared as income and thus must be laundered. Drug cartels often get around this by purchasing remote land and clearing it, allowing them to convert drug-money into legalized private property without leaving a trail. Large ranches or narco-estates formed by deforestation, often masquerade under the fronts of agriculture and oil palm plantations. Land titles are falsified, government officials bribed, and ultimately, such land becomes legalized when unsuspecting legitimate corporations purchase it from "locals" as an agricultural investment. "The result," conclude the authors in their article, "is [the] permanent conversion of forests to agriculture." The United States' "War on Drugs", a term coined by Richard Nixon who declared that drug abuse was "public enemy number one" in 1971, is a combined effort of justice systems and the military to clamp down on the illegal drug trade. The Obama administration has strayed away from using this term, preferring to see drug addiction as a disease that can be prevented and cured. The UNODC also supports a change in how drug-control is approached, arguing that the drug problem is a hemispheric issue, with demand restricted largely to the northern hemisphere supplied by production sites in the southern hemisphere. The UNODC suggests that a public health approach is necessary to address drug use, with no blanket strategy appropriate for all countries involved. 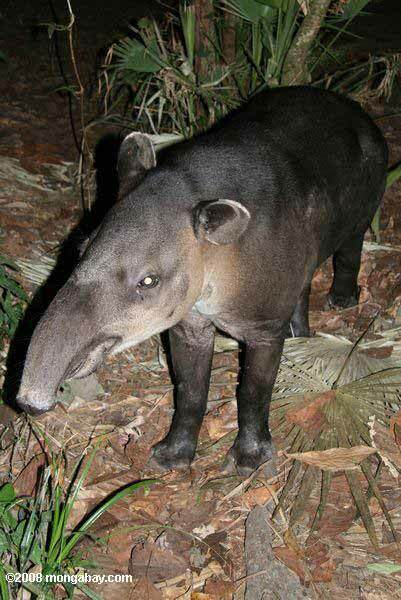 Baird's tapir (Tapirus bairdii) in Belize. Photo by: Rhett Butler. McSweeney and colleagues point out that eradication policies in the context of growing plants like coca, opium or marijuana, have forced growers to retreat into remote ecosystems that can ill-afford to face such threats. However, this same "balloon effect" has not been examined in much detail in the context of drug transportation. The authors argue that drug interdiction efforts could conceivably exacerbate pressures on remote forests, instead of relieving them. For example, a successful interdiction program in 2012 in eastern Honduras caused levels of primary shipments to drop below 2008-levels. Unfortunately, as with Mexico before it, drug cartels have since moved their operations from Honduras to areas in eastern Nicaragua, impacting new forests and leaving behind a scarred ecosystem. McSweeney and the other authors urge policy makers to consider conservation and drug trafficking together in order to mitigate the effects of narco-trafficking on fragile Central American ecosystems. "Drug policies are also conservation policies, whether we realize it or not," McSweeney said. "U.S.­led militarized interdiction, for example, has succeeded mainly in moving traffickers around, driving them to operate in ever­more remote, biodiverse ecosystems. Reforming drug policies could alleviate some of the pressures on Central America's disappearing forests." 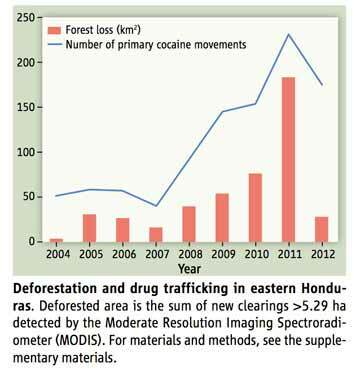 Deforestation increased with the number of primary cocaine movements. Figure adapted from McSweeney et al. 2014. McSweeney, K., Nielsen, E. A., Taylor, M. J., Wrathall, D. J., Pearson, Z., Wang, O., & Plumb, S. T. (2014). 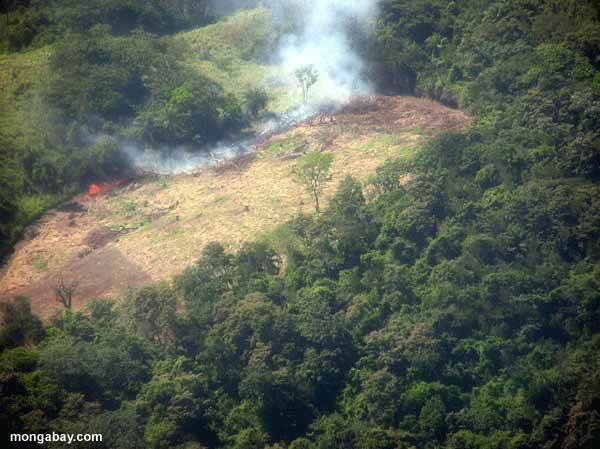 Drug Policy as Conservation Policy: Narco-Deforestation. Science, 343(6170), 489-490. Miller, K., Chang, E., & Johnson, N. (2001). Defining common ground for the Mesoamerican Biological Corridor. Report: World Resources Institute. The Drug Problem in the Americas: Analytical Report. (2013). Organization of American States. Transnational Organized Crime in Central America and the Caribbean: A Threat Assessment. (2012) The United Nations Office on Drugs and Crime. 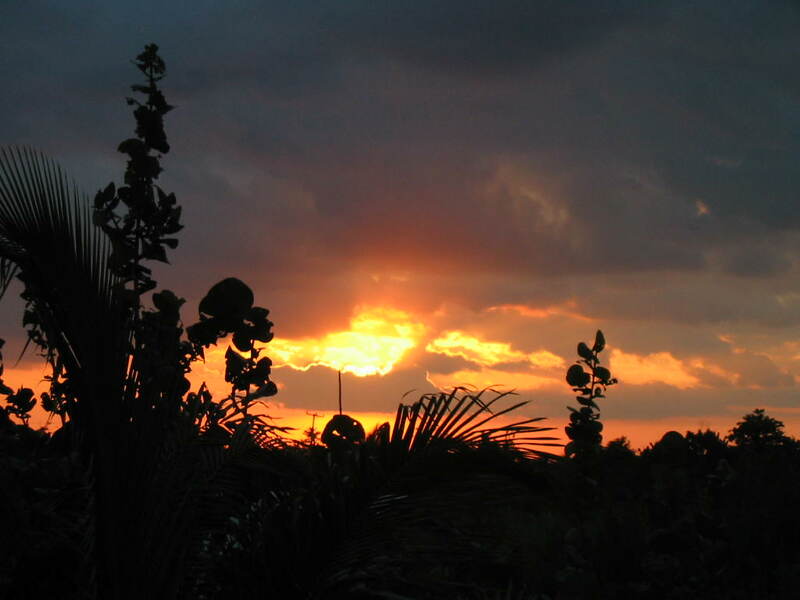 A clandestine airstrip on Roatan? Photo of same by Rhett Butler? Somebody is funnin with us ....? Highly unlikely than there exists a clandestine airfield on Roatan. LOL. I'd love to see those planes sneaking in and out, no one noticing. You know like they do on Ambergris Caye. Boy, I dont know, seems possible in Roatan, We were looking at real estate there and many large acreage properties were guarded with watchmen with guns, many roads we tried to drive down to explore the Island also had armed gunmen telling us not to trespass. Because Roatan is a volcanic island the many hills/mountains would shield many runways. You cant compare Roatan with Ambergris. Right, can't compare the two. IMNSHO, planes would be noticed, probably even sooner than on Ambergris regardless of the terrain. I too have been all over the island a number of times. There are areas that aren't protected by security, regardless, planes landing would be noticed. There is a police and military presence on the island. Keep in mind there is an airport there that receives international flights, which is another significant difference between the two islands. Last edited by seashell; 03/15/14 11:28 PM. Totally disagree, probably 100 or more areas on Roatan that a small Cessna could take off in hand cut bush land, its done around the world in dense areas. Radar from the Roatan airstrip would never pick up a Cessna at 100 to 500 ft that takes off out to sea. Why do you think we find these planes landing here in Belize every so often, On the mainland. we cant pick them up either. I am basically talking about planes taking off as more drugs are smuggled out of Honduras than into Honduras but it would be much easier either way then Ambergris...just simple minded things like gee, ya think even in the most isolated area on Ambergris someone wouldnt notice a landing strip being cut, or someone wouldnt notice a plane landing other than on the airstrip? Come on....and also those guys with guns in Roatan were not security or they would have let us in, they were protecting the lands within...huge machine guns and dogs..no badges or uniforms...you dont need 5 or more guys with those huge guns and 10 dogs to protect a valley area that is mostly not privately owned. It would make sense to boat drugs to outer islands and fly them out on open water, thats why they do it!!!! OK Cooper. You are usually right. No I am often wrong, Thats when I go away for awhile to recover like we all do. My problem like alot of us is after we get home and have a few drinks we have no newspaper to read or interested in T.V. so we post on various messageboards, I have to stop doing that....I thought everyone knew that about me by now.